<br>MotorStorm has ripped-up the Monument Valley desert, it's obliterated everything that stood in its path on Pacific Rift, and now it's set for a whole new challenge. Battling the frozen wasteland of Alaska's Arctic Edge. 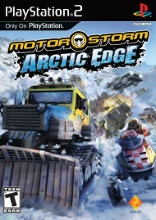 MotorStorm Arctic Edge delivers brutal off-road racing in the breathtaking yet lethal and unpredictable setting of Alaska. With temperatures plummeting, sudden avalanches, broken ice bridges, and three different racing altitudes, Arcitc Edge is the most inhospitable environment the Stormers have ever faced. With grip at a premium, and in addition to the six vehicle classes from the original MotorStorm, two new vehicles have been introduced to combat the ice, the cold and the snow - the Snowcat and the Snow Machine. One has the power and size to blast through packed snow, while the other has the grip and pace to combat most of what the sub-zero conditions can throw at it. MotorStorm Arctic Edge is great for single player action, online multiplayer or playing with friends; two to eight players can compete against each other wirelessly via Ad Hoc Mode on PSP. Alternatively, you can also compete via online multiplayer using Infrastructure Mode on PSP to make it to the summit of the online global leaderboards.